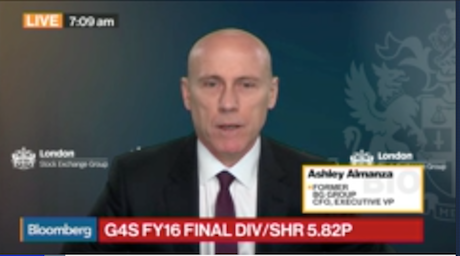 G4S boss Ashley Almanza said the BBC team who exposed abuse in a G4S child prison deserved to win their BAFTA Award. Almanza was speaking at the company’s annual meeting on 25 May at the Holiday Inn, in Sutton, Surrey. An undercover BBC reporter had filmed shocking abuse of child prisoners at G4S Medway Secure Training Centre in Kent. One boy, who had self-harmed, was subjected to unlawful violent restraint on the anniversary of his mother’s death. A burly G4S guard yelled in the face of another child, aged 14, grabbed him, pushed him onto a table, twisting his arms behind his back. The BBC Panorama film, broadcast in January 2016 won the current affairs BAFTA in June 2017. Almanza, G4S chief executive officer, commended the documentary, saying that Panorama had performed a “good public service” and “deserved” the BAFTA. He confirmed that G4S has withdrawn from two of the three youth service government contracts to date, following the Panorama revelations. Almanza’s comments came in response to a series of questions that Reclaim Justice Network members put to G4S directors at the company’s annual general meeting. Reclaim Justice Network campaigners advocate social justice, not criminal justice, and call for the immediate and complete withdrawal of G4S from all criminal justice services in the United Kingdom. The UK government continues to rely on ineffective practices of policing, surveillance and prison to address complex economic, social and political problems. The prison industrial complex describes the overlapping interests of government and private industry in the criminal justice sector. G4S profits from government contracts in care and justice services. G4S proudly claims to be “the world’s leading, global, integrated security company”. According to its 2016 annual report, the company boasts a massive £296 million profit before tax. The market dominance of G4S is perhaps surprising, given its long, tainted history of serious failings. For the fourth consecutive year Reclaim Justice Network members attended the meeting, as shareholders, to challenge the board on the company’s record. Airport-style security measures, intimidating and intrusive, have become routine at G4S annual meetings. All electronic devices, bags and accessories had to be removed and placed within a locker. Every shareholder was required to walk through a metal detector and then have their body scanned by a guard armed with an electromagnetic wand. Uniformed G4S guards, and other staff identifiable by their blue lanyards, lined the walls and were strategically placed amid the rows of shareholder seats. Once the meeting began it became clear that G4S personnel overwhelmingly outnumbered the independent shareholders in the room. John Connolly, G4S chairman, opened the meeting, drew attention to the “meeting procedures” and warned that anyone who disrupted the meeting would be asked to leave. “Safety is incredibly important and is our number one priority,” he said. Nine board members sat at the front table. What followed was a fine-tuned and polished performance of weaving evasiveness by chairman John Connolly and chief executive officer Ashley Almanza. A question was posed concerning remuneration and awards to staff. Specifically, the performance-related pay awards given to the senior managers at Medway youth jail in April 2016 that amounted to between 10% and 25% of their annual salaries. A report by the Chief Inspector of Prisons concluded that “managerial oversight failed to protect young people” who suffered both physical and psychological abuse at the prison. Almanza, who took home £4.8m in pay and perks last year, said that those directly involved with the abuse had been removed from their positions and subjected to a police investigation. However, he avoided commenting on the bonuses received by the senior managers whose failed oversight arguably put young people at risk of harm. Another question concerned G4S’s new recruit Paul Kempster — until recently a civil servant and “head of custodial contracts” for 12 UK prisons. The questioner wanted to know the time lapse between Kempster’s government job and the start of his contract at G4S. This is not the first time that government employees have been snapped up by G4S. The revolving door creates inevitable conflicts of interests in government decision making and increased interference of private companies in the public sector. John Connolly, by the way, was formerly senior partner and chief executive at the big accountancy firm Deloitte’s where he trousered a £5m annual pay package just as the financial system came close to collapse. Another questioner asked about faulty electronic monitoring equipment administered by G4S, that may have led to unwarranted enforcement action. Almanza said the faulty batches were removed and “the client”, meaning the Ministry of Justice, was satisfied with this response, although no investigation into the consequences of this error was undertaken. The shareholder then asked how many fines and penalties G4S has paid because of contractual failures, such as this. Almanza said he was “not at liberty to disclose”, there were confidentiality concerns, and he directed shareholders to “ask the client”. The questioning then moved onto a riot in Birmingham prison in December 2016. Prisoners took over four wings for 12 hours, igniting fires and destroying prison records. The shareholder asked whether the board agreed that “G4S are not fit to run prisons”, given that it had overseen “the worst prison riot in 26 years”. Connolly intervened and instructed Almanza “not to answer”, claiming the comment was phrased as a statement, not a question. Almanza said that he didn’t agree with the shareholder’s statement and “neither do our clients”. The board refused to discuss the riot or elaborate further. Concerns about safety in G4S prisons were raised by another shareholder who asked whether rates of self-harm and suicide had improved. Almanza took the question. He was quick to point out that self-harm has increased across UK prisons. He explained that in the last year there had been 344 non-natural deaths in prisons, including seven in prisons run by G4S. This raises concern. G4S are not specialists in mental health provision and prisons are not institutions fit for vulnerable individuals experiencing mental illness. Almanza, in his own words, described the “daunting, unsettling and isolating” environment of prison that can lead to self-harm. Concluding remarks were made by a shareholder who expressed disappointment with the lack of direct answers provided to the shareholders’ questions. Annual general meetings supposedly provide a forum for transparency and accountability. This meeting lacked both. At the start one shareholder had complained that the minutes of the 2016 G4S annual meeting were the “worst set of minutes” she had ever seen. They covered only formal business and failed to record serious concerns raised by shareholders. G4S’s legal officer asserted that the minutes complied with legal requirements. During the meeting, the board consistently failed to provide specific information that shareholders requested — from statistics on self-harm to details of financial penalties. For many of the issues raised the responsibility was passed to their clients, the Ministry of Justice. John Connolly did invite shareholders to put any specific questions in writing, guaranteeing that the board “will get back to you”.